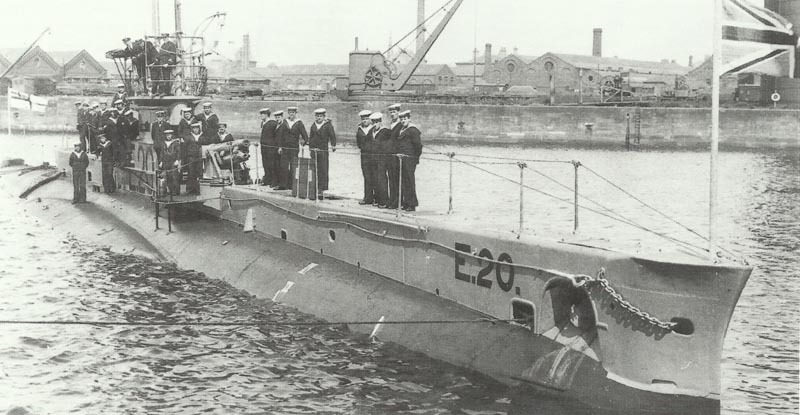 The British submarine ‘E20’ at its commissioning on 30 August 1915. It was one of the victims of ‘UB 14’. Dardanelles: British submarine E20 torpedoed and sunk by Geramn coastal-submarine UB14 (Heimburg) thanks to Allied submarine rendezvous code capture (see October 30, 1915), but E11 returns save. Champagne: Heavy-calibre shelling in entire region without infantry action. Baltic Provinces: Russian counter-attack with Baltic Fleet support retakes Olai (on Riga­-Mitau railway), Kemmern (November 11) with following Germans retreat on November 13. Cameroons: 250 British soldiers occupy Chang; Cunliffe’s 450 Nigerian troops capture Banyo Mountain in rain (attacked since November 4) for 60 casualties, Germans lose 116 of c. 223 soldiers. Advance to south resumed on November 8. East Africa: Churchill asks Prime Minister for post of C-in-C and Gouverneur-General. Bonar Law backs idea on November 12. Britain: Globe newspaper suspended (until November 20) for false rumour of Kitchener’s resignation. Asquith proposed his Gallipoli visit on November 3.